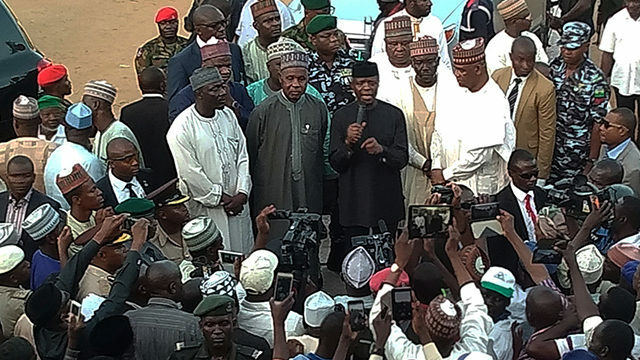 Vice president Osinbajo visits Kastina state , commiserates with flood victims – Royal Times of Nigeria. Emergency services in Nigeria says flooding caused by torrential rains on Nigeria’s border with Niger has left more than 52 people dead and another 20 missing in Katsina State. According to emergency agency ,the actual numbers of casualties may never be known because of the time the downpour and flooding occurred. Meanwhile ,the official death toll rose from 44 on Monday just as the vice president, Professor Yemi Osinbajo, visited the scene on Tuesday to commiserate with victims of the Jibia natural disaster that also destroyed about 500 houses and more than 5,000 people rendered homeless. A resident, who gave his name as Balarabe Yusufu, said many people were actually swept away by the flood, which occurred between 11:00p.m. on Sunday and 4:00a.m. on Monday. The Vice President, who paid a condolence visit to the state said government will collaborate with the state and National Emergency Management Agency (NEMA) to compensate the victims.